Andrew Thompson, Ph.D., describes ocean circulation around Antarctica and the fate of the ice sheets. 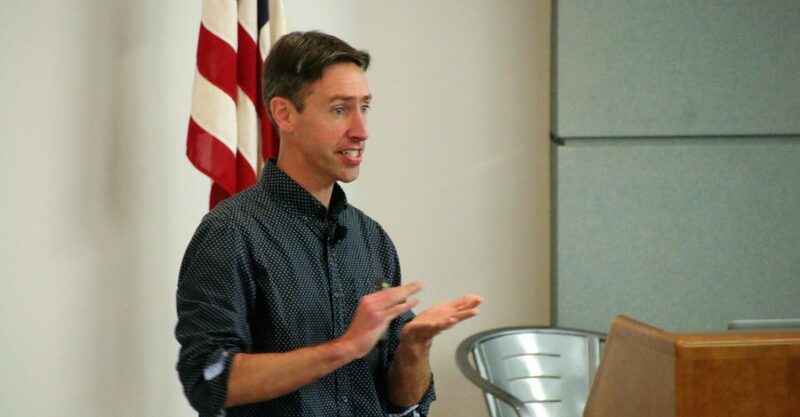 ST. PETERSBURG, FL – Dr. Andrew Thompson from the California Institute of Technology wrapped up the 2019 Eminent Scholars Lecture Series with a fascinating description of the ocean circulation around Antarctica and how it relates to ice sheet melt. The oceans take up a remarkable 93% of the additions of heat to the atmosphere, and due to the process of circulation, cooler waters are continually brought to the surface, subduing the heating effect on the atmosphere. However, over time, heat that circulates down to the depths of the ocean must eventually be returned to the surface, and one of the main places where this occurs is in the Southern Ocean, near Antarctica. Looking at the Southern Ocean, which encircles Antarctica, the transfer of heat towards Antarctica happens in jumps, or steps. Certain areas see a much greater number of water particles moving southward than other areas. Satellites show what is happening at the ocean surface, but it is hard to fully understand the complex interactions at depth because measurements are few and hard to come by. Recent glider data shows warmer Circumpolar Deep Water, often in intermittent bursts, is penetrating further up onto the Antarctic shelf. With help from colleagues at NASA’s Jet Propulsion Lab using synthetic aperture radar, Thompson has generated a product that can now show ocean current velocities (derived from sea surface height) in the inner regions of the Southern Ocean where, previously, sea ice prevented measurements of sea surface height by traditional radar altimetry. Understanding the coupling between ocean circulation and ice sheet melt will help researchers make better predictions of sea level rise in the future. Gliders, stressed Thompson, are a key tool that will enable researchers to gain that next level of understanding. Due to the difficulty of controlling and recovering a glider sent underneath an ice shelf, Thompson stated that gliders probably should be considered disposable for these missions. The data is so important that he feels it is worth losing a glider from time to time.